This harmless native garter snake has flattened its body and coiled up to make itself look bigger. It probably feels threatened. It flicks out its forked tongue to “taste” the air for scents. The slightly different scent information from the two forks helps the snake to locate what it smells, just as information from two nostrils helps us to follow the direction of a scent. Have you seen a snake lately? And if so, did you regard it as friend or foe? Whatever you thought, remember: All the snakes we might see here in town are harmless. We can relax. Westborough has no poisonous snakes. You’re most likely to see a common garter snake (Thamnophis sirtalis) in our area. Garter snakes are active during the daytime, and they frequent all kinds of areas – woods, fields, swamps, roadsides, backyards, and gardens. They like to hang around water, so look for them near streams, ponds, vernal pools, and swamps. Why? That’s where they find their favorite food, namely amphibians such as frogs and salamanders. But they also like toads and earthworms, typically found in drier places. You might also see a close relative of the garter snake, the eastern ribbon snake (Thamnophis sauritus). It’s a near look-alike for a garter snake. Ribbon snakes like water even more than garter snakes do, and they’re likely to flee into the water and swim away across the surface as you approach. They tend to stay more hidden – in grasses and bushes – so they’re a bit harder to spot than garter snakes. Both garter snakes and ribbon snakes grow to about the same length, between 1-1/2 and 3 feet long. Each has three light-colored stripes running lengthwise along a dark body. Garter snakes often have a checkered pattern between the light stripes. Ribbon snakes are slimmer and sleeker-looking, with a narrower head. Garter snakes are oddly named, or so it seems to us. Their name comes from their resemblance to the striped garters that men (not women!) wore in earlier times to hold their socks up. Ribbon snakes were named for their thin, ribbon-like body. It’s not easy to meet up with a snake. Like other wild animals, they’ll avoid you if given half a chance. When you’re walking the trails in town, you might notice a garter snake or a ribbon snake basking in a sunny patch on the trail ahead of you. Like turtles, snakes are cold-blooded, and they bask in the sun to warm up their bodies so they can move quickly and easily. Chances are that any snake you spot will slither quickly off the trail before you even get close. If you look to see where it went, you might glimpse it as it moves away. If you hear a slight rustling in the dry leaves beside a trail, stop and take a look. You might see a garter snake or ribbon snake heading for the safety of the underbrush. And don’t be surprised if you find a snake in a bush or on low tree branch. They can climb, perhaps in search of tree frogs or birds’ eggs. Around a garden, a garter snake might eat earthworms, slugs, insects, and mice. Garter snakes and ribbon snakes don’t have fangs or venom to use on their prey, and they don’t coil around their prey and squeeze it to death. They have tiny teeth, only about 1/8th of an inch long, but they don’t chew. They simply latch onto their prey with their mouth and swallow it whole. They get their mouth around a large meal thanks to their loosely attached jaws and stretchy skin. Garter snakes are well equipped to prey on amphibians. Their saliva is toxic to amphibians, and garter snakes themselves are immune to the toxins in the skin of toads. This native ribbon snake is harmless, like all other snakes found in Westborough. It looks similar to the garter snake, which is a close relative, but it’s slimmer and sleeker-looking. Notice that it lacks the checkered pattern seen on the garter snake. Even if you don’t see a snake, you might find a snakeskin. As they get bigger, snakes outgrow their skin and need to shed it several times a year. When the time comes, the snake hides and becomes sluggish. A layer of fluid builds up between the old skin and the new skin underneath, and the snake’s eyes turn cloudy. (Their eyes are protected by a clear cap, rather than eyelids.) After a few days, the cloudiness disappears and the snake leaves its hiding place to rub on rough stone or wood, which catches on the old skin so the snake can slide right out of it. 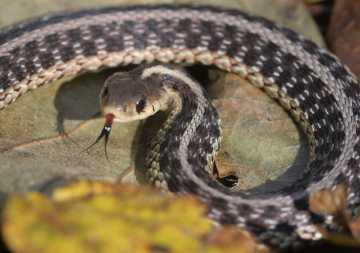 Garter and ribbon snakes aren’t just predators – they’re also bird food. Hawks, owls, herons, wild turkeys, and crows capture them. Blue jays and robins gobble small young snakes as if they were worms and even feed them to nestlings. Snapping turtles, bullfrogs, large fish, other snakes, raccoons, foxes, and dogs and cats also prey on garter and ribbon snakes. Garter and ribbon snakes are protected by their colors and patterning, which help them to blend into their surroundings, and their habit of fleeing danger. When cornered, they coil up to look big and threatening. If caught, they thrash around, release foul-smelling fluid from their scent glands, and try to bite. For humans, a bite from a garter or ribbon snake is an unlikely event, especially if you leave the snake alone. A bite is also a minor event. Wash the area, and maybe put a band-aid on it. Occasionally, someone might be sensitive to the snake’s saliva and get a rash or slight swelling. Garter and ribbon snakes come out of hibernation in late March or early April, so we can regard them as a sign of spring – which is their mating season. Then, as spring fades into summer, the season for baby snakes approaches. In August or September, these snakes give birth to live young, typically 10-40 for garter snakes and 4-25 for ribbon snakes. The baby snakes are 5-8 inches long and look like their parents. They may stay near their mother for a day but get no parental care. Baby snakes may follow the adult’s scent trail toward food. Like the parents, the young snakes flick out their tongue to gather molecules of scent and then rub them onto a special scent organ on the roof of their mouth. In late October or early November, garter and ribbon snakes find holes in the ground or rodent burrows that take them below the frost line. There they stay mostly dormant for the winter. Several snakes of one kind may hole up together. Massachusetts has 14 different snakes. The only two venomous snakes – the copperhead (Agkistrodon contortrix) and the timber rattlesnake (Crotalus horridus) – are so rare that they are listed as endangered species. It’s against the law in Massachusetts to kill them. Neither lives in Westborough, nor even in Worcester County. Enjoy any snake sightings that you’re lucky enough to have! And avoid running over snakes with your car.